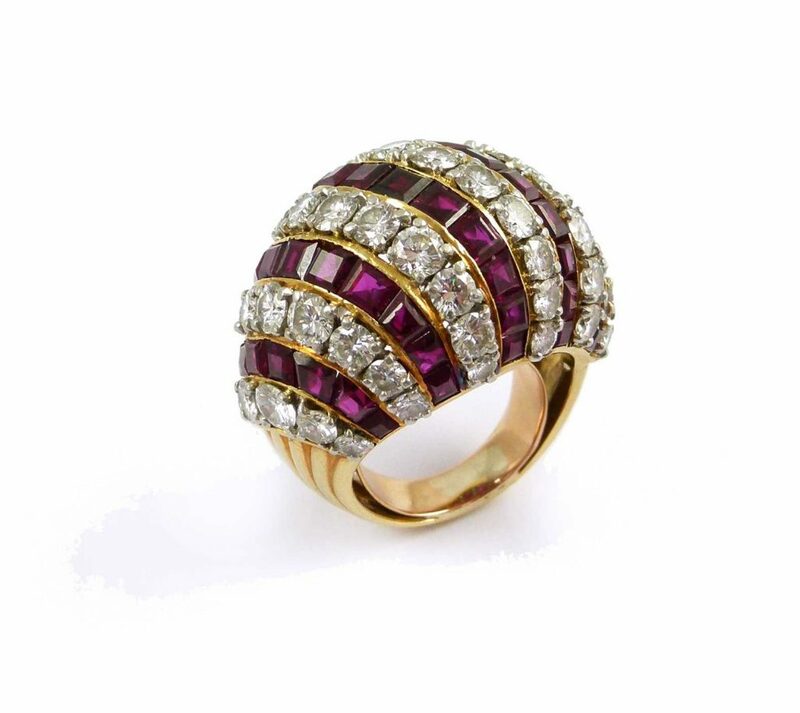 All styles of rings have existed throughout history, some of them achieving a truly fantastic history. The Emerald Isle, Named for a Ring? The painting Prometheus by Gustave Moreau, 1868. According to Greek mythology, Prometheus, a member of a group of immortals called the Titans, owned the first ring. According to legend, Prometheus took pity on mortals and gave us the gift of fire, which he stole from the gods. As punishment for this act, he was chained to a rock and tormented each day by an eagle that feasted on his liver. 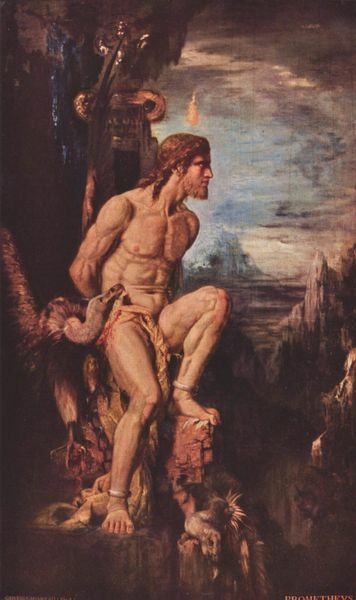 After many eons of suffering, Prometheus was freed on the condition that he would wear a reminder of his punishment to prevent further misdeeds. As a result, a ring was fashioned from the iron chains that bound him and set with a piece of the rock. A simple version of the Seal of Solomon. In antiquity, signet rings, an emblem of power and authority, were also used as magical rings. In Medieval Jewish, Islamic, and Christian legends for example, King Solomon had a magical ring inscribed with a hexagram or “Star of David,” which was known far and wide as the “Seal of Solomon.” According to legend, it gave him the power to command the spirits of the air, the earth, and the underworld. Candaules King of Lydia Shows his Wife to Gyges, William Etty, 1820. Gyges was a Lydian king who reigned from 716-678 B.C. There are conflicting accounts of how Gyges came to power. In one version written by Plato, Gyges was a shepherd in the service of King Candaules of Lydia. After an earthquake, Gyges found a cave containing an enormous dead man with a gold ring. Gyges took the ring and later discovered that it gave him the power to become invisible. He employed the ring in service to his King, but he also used it to seduce the king’s wife. In a conspiracy of love, Gyges murders the king, and becomes the king of Lydia himself. Plato uses Gyges as an example of man’s inability to resist evil if they do not fear the consequences. According to Herodotus, Polycrates ruled the Greek island of Samos with a firm hand from 538 to 522 B.C. During the course of his reign, he formed a political and military alliance with Amasis II, the Pharaoh of Egypt. Amasis was a very superstitious man. He believed that the extreme good fortune and continual success of Polycrates was likely to offend the gods. Therefore, he urged Polycrates to discard his most prized possession in order to escape misfortune. 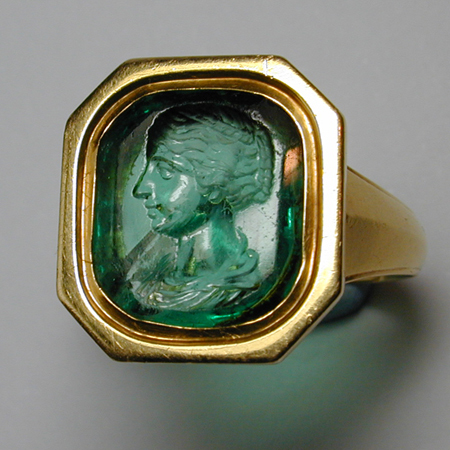 Polycrates obliged and cast his beautiful engraved emerald ring into the sea. A few days later, the ring was found by Polycrates’ cooks in the belly of a fish they were preparing for his dinner. Of course Polycrates was overjoyed to have his ring back, but when news of this new stroke of good fortune reached Amasis, he immediately severed his relationship with the king. Amasis believed that the gods had rejected Polycrates’ gift and that he was bound to pay in the end. 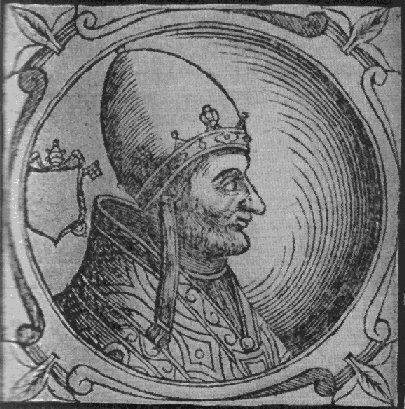 A likeness of Pope Adrian IV. The Emerald Isle Named for a Ring? A possible origin for Ireland’s famous nickname is found in a papal bull entitled Laudabiliter, which means “it is praiseworthy.” The bull was issued in 1155 by Pope Adrian IV, and it gave the Norman King Henry II of England sovereignty over Ireland. Henry II depicted in Cassell’s History of England (1902). 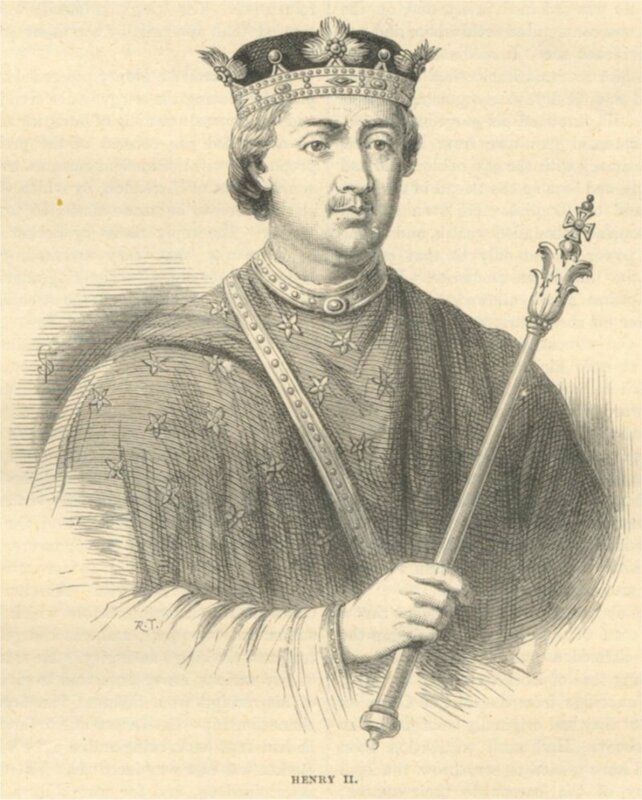 Although the Norman invasion of Ireland actually occurred at a much later date, according to the diplomat John of Salisbury, at the time the Laudabiliter was issued, Pope Adrian IV forwarded a fine emerald ring to King Henry II together with the official Brief of Investiture. Although Ireland is known for its lush green landscape, many believe its nickname, The Emerald Isle, has its roots in this story. The Papal ring of Benedict XVI, known as the Fisherman Ring. 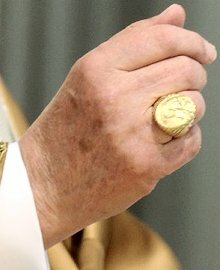 The Ring of the Fisherman, also known as the Piscatory Ring and the Pescatorio (in Italian), is the official signet ring of the Pope. Popes in the Catholic Church are considered the successors of Saint Peter, a fisherman by trade. 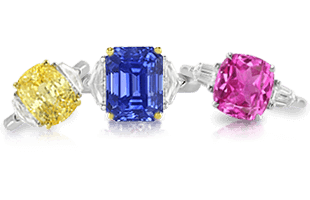 These rings are part of the official regalia worn by the Pope. When a pope dies, his ring is destroyed and another is made for his successor. According to tradition, followers show respect for the Pope by kneeling and kissing the Fisherman’s Ring. A letter written by Pope Clement IV in 1265 includes the earliest known mention of the Ring of the Fisherman, which was used to seal private correspondence with red sealing wax. In contrast, public documents, historically called “papal bulls,” were sealed by with a bulla of lead. 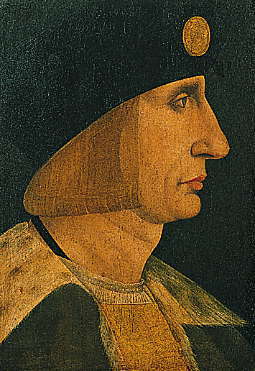 A portrait of King Louis XII. Among the largest intaglio ruby rings known today is one engraved with a portrait of King Louis XII. In 1514, the 52-year old King of France was married to 18-year-old Mary Rose Tudor, who was reputed to be one of the most beautiful princesses in Europe. 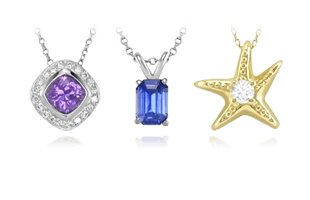 Mary Tudor, Princess of England, Queen of France in some of her famous jewelry pieces. 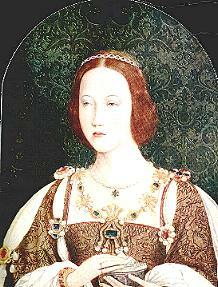 Mary Rose also happened to be the sister to Henry VIII of England. For Louis XII, unflatteringly described as “feeble and pocky,” this was a last ditch effort to produce an heir, and for Mary, it was an unhappy marriage arranged for political gain. Louis XII died a few short months after the wedding. The ruby intaglio ring that bears his portrait is likely a 1515 memento ring sent on his death to his brother-in-law Henry VIII. 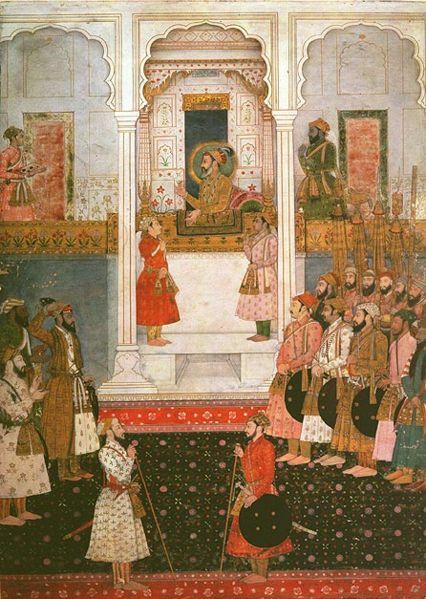 The glittering court of Shah Jahan. Shah Jahan (1592-1666) was a Mughal Emperor whose name in Persian means “King of the World.” He, like many of the other Mughal emperors, was an avid gemstone collector. He is perhaps best known for building the Taj Mahal as a tomb for his beloved wife, Mumtaz Mahal. An illustrated chronicle of his reign, called the Padshahnama, shows Shah Jahan wearing a white thumb ring set with rubies. A thumb ring is actually an archer’s ring, which is designed to protect the thumb while shooting. It is worn with the pointed side towards the thumbnail. 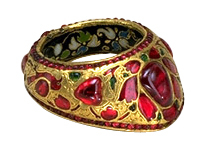 Similar thumb-rings are depicted in Mughal miniature paintings and many are found in museum collections today. 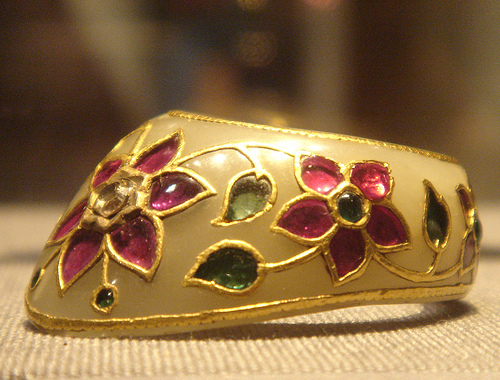 Many surviving thumb rings are too heavily ornamented to be usable and must have been intended for display only. A Super Bowl Ring is a National Football League award, which is given to the coaches and players of the team that wins the League’s annual championship game, the Super Bowl. 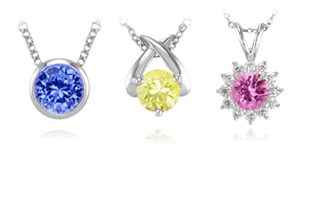 Super Bowl rings are typically made of yellow or white gold with diamonds. They usually include the winning team’s name, logo, and Super Bowl number. 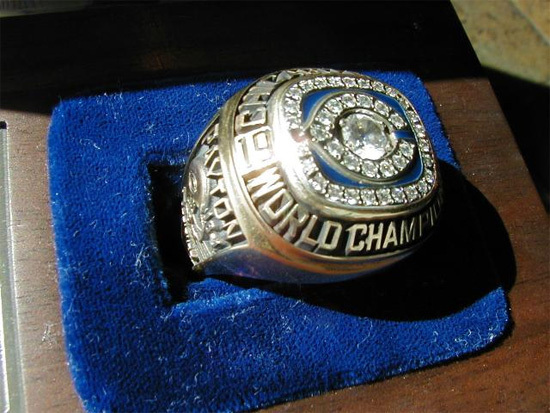 Replicas of actual Super Bowl rings are frequently sold as collectibles. Walter Peyton’s Super Bowl Ring. In June 2005, an event, now known as “The Putin Incident,” took place. At that time, New England Patriots owner Robert Kraft was in a business meeting with Russian President Vladimir Putin. During the meeting, President Putin asked to see Kraft’s 4.94-carat 2005 Super Bowl ring. Kraft removed the ring and handed it to Putin, who looked at it briefly, then pocketed it and left the room. After the fact, Kraft declared that he had intended for Putin to keep the ring as a gift. Only later was it reported that the ring was placed in the Kremlin Library among other foreign gifts of state. 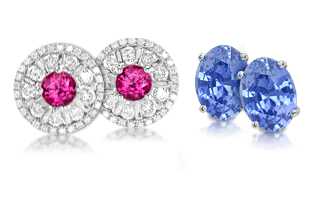 Continue next as we begin the exploration of earrings, their history, style and famous examples in Earrings | An Introduction to History and Style.